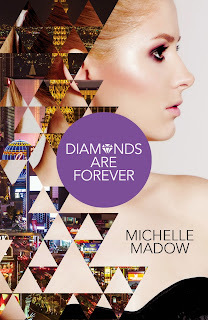 Michelle Madow: Pre-order Diamonds are Forever & receive an exclusive Swag Pack! Pre-order Diamonds are Forever & receive an exclusive Swag Pack! Who all is excited for the upcoming release of Diamonds are Forever, the newest and final book in The Secret Diamond Sisters trilogy? I know I can't wait to share it with everyone! In anticipation of the release, I'm offering an exclusive swag pack to US residents who pre-order Diamonds are Forever before October 27, 2015! The swag pack comes with a bookmark, lip balm, a Secret Diamond Sisters button, and Secret Diamond Sisters sticker. To claim your swag pack, fill out the Google Doc form HERE. Thank you to everyone who has followed Savannah, Courtney, and Peyton's adventures in the Diamond Sisters series! There will be many more exciting events happening in the coming weeks so keep an eye out for more newsletters and blog posts to come as we get closer to release day! This was a fantastic and satisfying ending that took me on this crazy ride with Courtney, Peyton, Savannah and even Madison. I LOVED EVERYTHING.